- Publisher Rummaging through some old books at a Goodwill Store more than twenty years ago, Robin Hardy came across a book that she picked up for a closer look. The musty smell, fragile brown pages, and the quaint old typesetting all intrigued her, so she took it home. 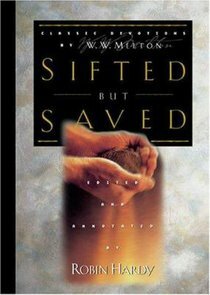 When she opened the pages, the words "leaped out with such aliveness that I kept checking the publication date to make sure it really said 1925".As Robin Hardy confirmed, Sifted but Saved was originally published in 1925. After seventy-five years, it remains a wonderful source of teaching and inspiration for believers. Retaining the original format, this collection is now reintroduced for a new generation of believers to reap the benefits of Dr. Melton's insights. Rummaging through some old books at a Goodwill Store more than twenty years ago, Robin Hardy came across a book that she picked up for a closer look. The musty smell, fragile brown pages, and the quaint old typesetting all intrigued her, so she took it home. When she opened the pages, the words "leaped out with such aliveness that I kept checking the publication date to make sure it really said 1925".As Robin Hardy confirmed, Sifted but Saved was originally published in 1925. After seventy-five years, it remains a wonderful source of teaching and inspiration for believers. Retaining the original format, this collection is now reintroduced for a new generation of believers to reap the benefits of Dr. Melton's insights.